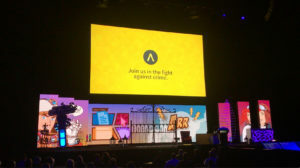 Our video playing on the Main Stage at SaaStr Annual. We travelled over 21,000 kilometers, met hundreds of other passionate startups, and participated in dozens of interesting talks and panel discussions at SaaStr Annual 2017—the largest conference in the world dedicated to helping software startups develop and grow their business. You may recall that Auror won the ‘Show Us Your SaaS’ competition put on by SaaStr earlier this year, which scored our team four VIP conference passes. It was a trip that we were looking forward to as an opportunity to network and learn, and boy did we ever! SaaStr was a massive show with 10,000 attendees and an agenda full of speakers that we could learn from. It was difficult to narrow it down, but here’s what we’re taking away from it. We’re going to change some things. Over the last year we’ve seen a massive increase in interest in Auror and our platform. In just 12 months we more than tripled our web traffic, and while we were chuffed with those numbers we know we can do even better. That’s why we’re going to start tinkering with different elements of our website to make sure it’s as good as it can possibly be, both for our community of users, potential customers, and for us here at Auror HQ. One of the big themes of the marketing sessions at the conference was to relentlessly test and re-test elements of your website, so soon we’ll start putting that advice into practice and run some experiments to see where we can improve. Kiwi pride was on full display. ‍Alex Fala from Vend on stage. Even though we were attending SaaStr through the video competition win, Auror was travelling as part of a New Zealand delegation organised by Callaghan Innovation that featured more than 30 of the most interesting and innovative SaaS companies the country has to offer. That’s an impressive number, and it wasn’t hard to pick out familiar accents floating through the halls at SaaStr during breaks between sessions. 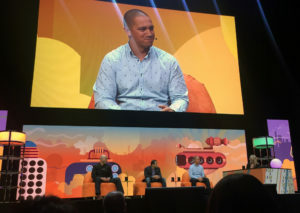 But there were also some high-flying Kiwi companies on stage at SaaStr as well. The team particularly enjoyed hearing Alex Fala from Vend talking about his company’s journey and how to reach a broad customer base, in a session deftly moderated by Keri Gohman from Xero. The value of mindful business. Not all the action at SaaStr was inside the confines of the venue halls. The Auror team also got around to visit some companies we admire, like Salesforce, Google, Lyft and Intercom. And while Silicon Valley companies are well-known for offering some pretty extensive employee perks (we’re still dreaming about those snack cupboards at Salesforce), there was a real emphasis on making it a priority for employees to practice self-care as part of their work culture. At Salesforce we saw meditation rooms done up like a Japanese zen garden. 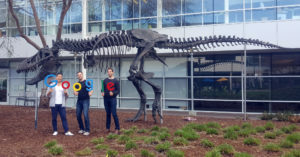 ‍Team Auror at the Googleplex. Google allows employees to spend 20% of their time working on R&D projects outside of their core area. And back at SaaStr, the keynote address of Day 1 was from Dustin Moskovitz (one of Facebook’s co-founders) all about creating a mindful business. But practicing mindful business isn’t just for big companies; it’s incredibly important for small companies too, particularly as they enter high-growth stages where they add employees quickly and risk diluting the company culture. We’re incredibly fortunate to have a strong company culture at Auror and will be sure to safeguard it. Without question it’s a big year ahead for Auror!